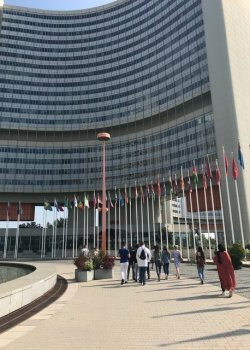 Students at Wittenborg University of Applied Sciences' campus in Vienna, Austria, recently visited one of the United Nations' many offices in the city as part of Project Week activities. Vienna serves as one of the UN's four headquarter cities where it has a couple of offices. The largest one is the International Atomic Energy Agency (IAEA). Students, accompanied by Wittenborg administrator Doris Napetschnig, first got a guided door at the UN offices, followed by a presentation from the United Nations Office on Drugs and Crime (UNODC) - which is also situated in Vienna. Afterwards there was an interactive question and answer session. For their Project Week presentations, students will have to write about the UN, its history, and in particular about the UNODC and the issue of human trafficking, and how the organisation is dealing with it. Besides the IAEA and UNODC, other UN offices in Vienna are the United Nations Industrial Development Organization (UNIDO) and United Nations Office for Outer Space Affairs (UNOOSA).